For 131,000 Spaniards at Montmelo on Sunday there was much to cheer about by the end of the race and, no doubt, across the country millions were busy dancing in the streets but around the world millions more were probably enjoying a little shut-eye as the excitements of recent races were not repeated. Once again it was evidence that Barcelona is a lousy place to hold a motor race and it would do the track good to spend some of its ticket money on building a first corner that would allow overtaking. 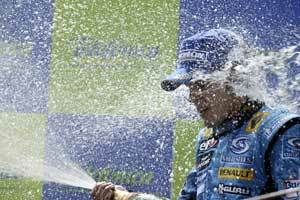 The race turned out to be a Renault advertisement although as usual Fernando Alonso played the starring role and Giancarlo Fisichella was a bit part player. The Italian was simply not fast enough to keep up with his team mate and although he did make a significant mistake on lap 26, losing around four seconds, it did not really affect his overall race. Either the car was not right or Fisichella cannot extract the same kind of performance from a car as Fernando Alonso. The team management will no doubt be looking closely at this as it considers what to do next year. With Alonso disappearing off to McLaren this might be very significant because in order to avoid changing both drivers next year, there is an option to put Heikki Kovalainen into the second Renault as soon as possible to get him race-trained. What was most interesting was that by the end of the day Ferrari was still fastest through all the speed traps and Felipe Massa had set the fastest lap of the race, although this was only a tiny margin faster than Alonso's best. The two were nearly three-tenths ahead of Michael and there was then a tenth or so to Fisichella. There was a gap of three-tenths back to Raikkonen, Button and Barrichello and then half a second before a Williams. The implication in all of this was that if the Ferrari was slower than the Renault in the corners, it must be down to the effectiveness of the tyres, given that the recent races have shown conclusively that the Ferrari has very efficient aerodynamics. Michael Schumacher is always diplomatic at such moments, saying that he was not sure what was to blame but one had only to look at the performance of the Williams and Toyota cars to know that. "We weren't quick enough here," said Mark Webber. Given Michael Schumacher's assured attitudes on Saturday, this was a bit of a surprise. The obvious explanation was that the temperature was very different and, sure enough, when one checked the temperatures there it was: Saturday had been cool but pleasant enough after early rains cleared away. Sunday was much warmer. At the start of the year the theory was that the Bridgestone tyres were better when the temperatures rose but in Spain that seemed to have been turned on its head, a sign that F1 these days is about constant development. And the thing that the engineers will be working day and night on from now until Monaco is the science of flexible composite structures as there is clearly advantage to be gained working within the current interpretation of the rules. Ferrari has been adept at understanding the FIA's attitudes while other teams appear to have been reluctant to step into what they appear to think is a minefield of interpretation that might explode beneath them. Tyres and drivers are clearly an important element in the 2006 World Championship but it is also clear that other teams have noted Ferrari's bravery and feel that they should now tiptoe into the danger zone. When that starts to happen we could well see further changes that may well throw up new winners. This will do the sport no harm at all at a time when TV viewing figures are what really matter. The danger is that having races like Barcelona will send the casual TV viewers rushing headlong to beach volleyball where the sponsor logos are located on rather more flexible surfaces. The only thing that kept this race alive was the possibility that Alonso was on a three-stop strategy and that Michael was going for two stops. The Renault team said afterwards that Fernando could have swung either way. Thirteen fastest laps in the first 16 laps was evidence that Alonso was running light and clearly Michael could not handle the pace because Fisichella was not getting in his way. Michael went six laps further than Fernando and the windows for the various strategies seemed to suggest that Alonso would be coming in again around lap 35 and then in the fifties but in the second stint Alonso did not pull away from Michael and nor did Michael close the gap and when they got to lap 40, it was pretty clear that Fernando was going for a two-stopper. Michael knew he was beaten and settled for points. Fisichella was third. Massa followed him home and then half a minute in arrears came Kimi Raikkonen. His dramatic start had been spectacular but "that was all the progress I was able to make". Juan Pablo Montoya started with a lot of fuel after his ghastly qualifying and was aiming to do a one-stop race but he spun out and got himself stuck on a kerb, pondering his future. Right behind Raikkonen at the finish was Jenson Button, who managed to avoid the humiliation of going a lap behind (which befell Rubens Barrichello). The Honda F1 cars need about a second a lap in race trim and they will be fine. Nick Heidfeld was eighth for Sauber BMW, 1.3secs ahead of Mark Webber's Williams while Jarno Trulli's Toyota followed its usual career path from seventh on the grid to 10th in the race. Still, this was better than Ralf Schumacher's efforts as the well-remunerated German made a rather feeble lunge down the inside of Trulli and took his front wing off on his team-mates rear wheel. A visit to the pits meant that Ralf was down the back and so no-one really noticed when the car stopped with electronic failure.